Background: Platelet-rich plasma (PRP) treatment has gained popularity among different surgical specialities for improving various conditions. Androgenetic alopecia (AGA) is a common disorder, with possible psychosocial implications. Plastic surgeons have increased the practice of PRP injections for hair restoration. A meta-analysis on this topic was performed comparing local injection of PRP versus control to investigate the efficacy of local PRP injections in AGA. Methods: We performed a systematic literature search. The increase in number of hairs was the primary outcome. Secondary outcomes were the increase of hair thickness and the percentage increase in hair number and thickness. Results: Seven studies involving 194 patients were retrieved and included in the present analysis. A significantly locally increased hair number per cm2 was observed after PRP injections versus control (mean difference [MD] 14.38, 95% confidence interval [CI] 6.38–22.38, P < 0.001). Similarly, a significantly increased hair thickness cross-section per 10−4 mm2 (MD 0.22, 95% CI 0.07–0.38, P = 0.005) favoring PRP group. The pooled results did not show a significant percentage increase in hair number (MD 18.79%, 95% CI − 8.50–46.08, P = 0.18), neither hair thickness (MD 32.63%, 95% CI − 16.23–81.48, P = 0.19) among patients treated with PRP. 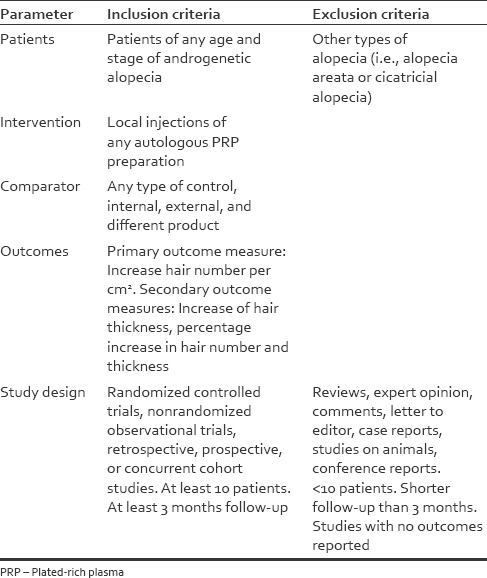 Conclusion: Local injection of PRP for androgenic alopecia might be associated with an increased number of hairs in the treated areas with minimal morbidity, but there is clearly a lack of scientific evidence on this treatment modality. Further studies are needed to evaluate the efficacy of PRP for AGA. Androgenetic alopecia (AGA) also known as male pattern baldness is the most common hair loss disorder affecting up to 80% of men and up to 40% of women with Caucasian heritage. For patients, alopecia causes major discomfort due to an altered appearance with significant implications in daily living and possible leading to depression and anxiety symptoms. Platelet-rich plasma (PRP) injections for hair restoration has emerged to a popular practice among plastic surgeons because both highly demanding patients and surgeons are seeking for minimally-invasive and cost efficient treatment modalities for androgenic alopecia. The scientific interest for PRP was raised in 2006 when Mishra and Pavelko managed to demonstrate the PRP efficacy in improving elbow epicondylitis, reducing the time for healing. Since then, PRP local injections started to become very popular which transversally interested many medical and surgical branches. PRP is an autologous product that is manufactured by centrifugation from patients own venous blood limiting the potential risk of disease transmission. Components of PRP includes several growth factors (GF), chemokines, and cytokines, suggesting that its benefits include promotion of tissue healing in hard- and soft-tissues., In a natural environment, platelets migrate into the inflammation site and release Alpha granuli, which are activated by platelets aggregation with a concentration of GF. In addition, local injections of PRP are a highly appealing treatment modality because they can easily be administered at outpatient clinic settings, with low costs. Meanwhile, rapid and uncontrolled interest from medical and nonmedical professionals mislead to believe PRP to be a carrier of mesenchymal, stem cells, adipocytes, and bone marrow, which is obviously not. Although there are several recent reports and small randomized controlled trials (RCT) examining the use of PRP for hair loss treatment, there are no sustained results on their overall efficacy,,, and none of these studies have been sufficiently powered to assess the risk benefit of this modality. Despite the heterogeneity of these studies and due to the lack of the previous meta-analysis specifically for comparative studies to evaluate this issue, we performed a whole comprehensive analysis hypothesizing that PRP might prove significant benefits in improving AGA. 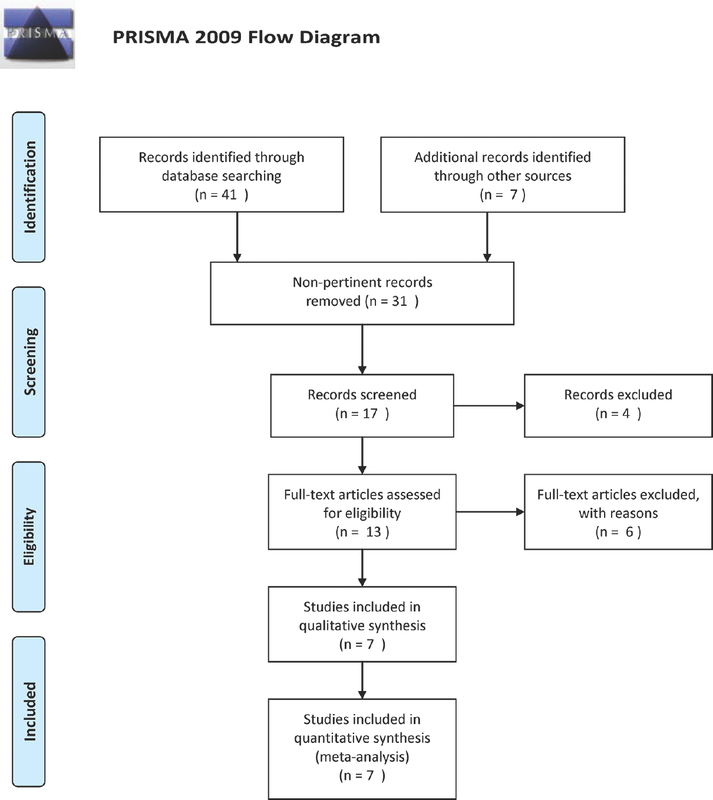 The objective of this review was to assess the literature on PRP outcomes for AGA, with a focus on specific clinical outcomes in a comparative view, in accordance with PRISMA statement for reporting this meta-analysis. The present meta-analysis is registered in PROSPERO, an international prospective register of systematic reviews, with the reference code CRD42016041811. All authors individually carried out a full systematic literature search of all records through Medline, Cochrane Library, Embase, Scopus, Google Scholar and Research Gate for any study on PRP use for hair growth therapy in androgenic alopecia from inception to August 2017. The terms employed in the search were: “androgenic alopecia,” “hair growth,” “hair restoration,” “baldness,” “hair loss” combined with “plated-rich plasma,” “PRP;” and they were combined using Boolean operators. Each author's search results were merged, and duplicate citations were discarded. The search was performed aiming at those studies comparing outcomes of PRP treatment versus control for hair restoration. No language restrictions were applied. We searched for, and assessed studies comparing local injections of PRP compared to any control for AGA. Studies to be included in this review had to match predetermined criteria according to the PICOS (patients, intervention, comparator, outcomes, and study design) approach. Criteria for inclusion and exclusion are specified in [Table 1]. No limitations were applied on ethnicity, the age of patients or method of PRP processing. Two authors (SG and PL) independently reviewed the abstracts and articles. In addition, the reference lists of all relevant articles were scrutinized as well. For the purpose of this analysis, the eligible studies were those reporting on quantitative outcomes on PRP compared with control treatment for AGA. Each study was independently evaluated by all three co-authors (SG, MR, PL) for inclusion or exclusion from this analysis [Table 1]. To be included, studies had to provide details on baseline characteristics, type of procedure, method of PRP processing, and outcomes on hair regrowth compared with control patients or areas in the same patient (internal control). Data were independently collected by two investigators (SG and PL) and checked by a third investigator (MR) only from the retrieved articles. Disagreement on collected data was settled by consensus between these investigators. No any attempt was made to obtain specific or missing data from the authors. The following data were extracted: first author, year of publication, study design, number of patients, type of procedure, and primary and secondary measures. The quality of the included studies was independently assessed using three investigators (SG, MR, PL) using the Cochrane Collaboration's Risk of Bias Assessment tool for RCT  while using the Newcastle–Ottawa Scale to evaluate the individual non-randomised studies. The research team convened to resolve any disagreement on the assessment and to reach consensus. The primary outcome was the difference in number of hairs per square centimeter. Secondary outcomes were hair cross-section increase, hair regrowth, and thickness percentage increase. Statistical analysis was performed using Review Manager 5.3 software (Copenhagen: The Nordic Cochrane Centre, The Cochrane Collaboration, 2014). Differences in continuous variables were expressed as mean difference (MD) with 95% confidence interval (CI). Heterogeneity was assessed using I2 statistic, which describes the percentage of total variation across studies that is due to heterogeneity rather than chance.I2 values were evaluated as low, moderate, or high at 25%, 50%, or 75%, respectively. To perform the meta-analysis, the inverse variance statistical method was used for continuous outcome variables. In all cases, we performed random-effect analysis, which consider the variation both within- and between studies , because of the observational nature of some studies included in this analysis. A value of P < 0.05 was considered to be statistically significant. Finally, we conducted sensitivity analyses omitting each study, in turn, using the “leave one out” methodology to determine whether the results were influenced excessively by a single study. 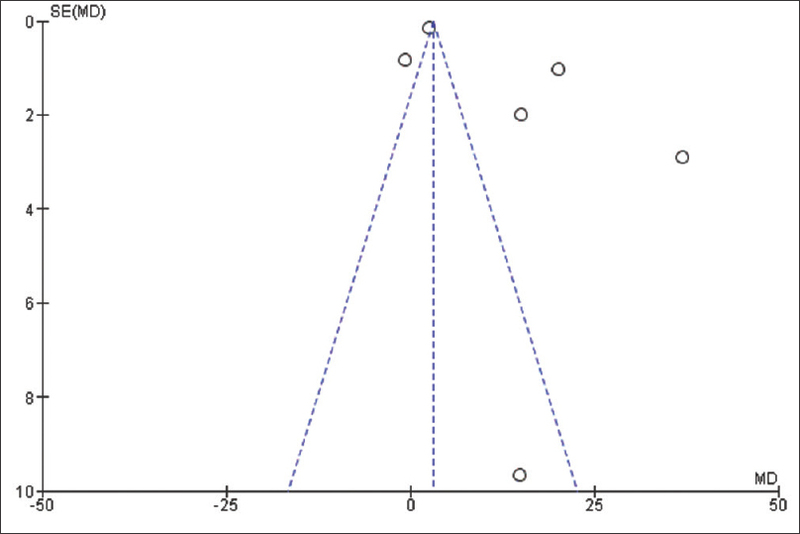 Publication bias was assessed using the funnel plot for the primary outcome. The literature search yielded seven articles ,,,,,, pertinent to this issue and sources of information on outcomes using PRP injections on scalp for AGA [Table 2]. The literature search flowchart is shown in [Figure 1]. In the RCT, the risk of bias was either low or unclear using Cochrane Collaboration's tool for assessing the risk of bias [Supplemental Table 1] [Additional file 1]. The nonRCTs were assessed with the Newcastle–Ottawa Scale for risk of bias resulting in 0 to 4 stars per category, indicating a high to low bias [Supplemental Table 2] [Additional file 2]. The difficulty blinding participants and researchers, as well as, the presence of internal control increased the overall risk of bias. The age of the patients ranged from 19 to 63 years, with a follow-up from 3 to 24 months. All the studies showed different centrifugation methods [Table 2]. Six studies,,,,,, involving a total of 132 patients, reported results on MD of number of hairs per cm 2 versus control and pooled analysis showed a significant difference between the two treatment groups [MD 14.38, 95% CI 6.38–22.38, P < 0.001; [Figure 2]. Similarly, this outcome persisted when only the 4 RCT were pooled together [MD 3.96, 95% CI 2.50–5.42, P < 0.001; [Figure 3]. Among secondary outcomes, we also observed a significant difference between the two treatment groups concerning the hair cross section measured per 10−4 mm 2 [MD 0.22, 95% CI 0.07–0.38, P = 0.005; [Figure 4] favoring PRP group, but these data were reported by only 2 studies., We did not found a significant difference between the two treatment groups concerning the percentage increase of hair number [MD 18.79%, 95% CI − 8.50–46.08, P = 0.18, [Figure 5] nor hair thickness [MD 32.63%, 95% −16.23–81.48, P = 0.19; [Figure 6]. Although not statistically significant, these pooled results showed a trend toward an increase of hair number [Figure 5] and hair thickness percentage [Figure 6]. Four of the included studies ,,, did not report any adverse effects or complications associated with PRP injections. In the other two publications, information about possible adverse effects were not reported. Finally, the exclusion of most studies from the analysis did not materially change the summary estimates, with sensitivity analysis using the “leave one out” methodology; however, significant asymmetry in the funnel plot was observed for the primary outcome [Figure 7]. There is no a standardized method for PRP preparation, therefore, there might be differences in product composition. This fact may lead to an altered PRP function, which might explain the controversy found into the literature. Furthermore, differences in PRP composition result from differences in the samples retrieved from person to person. Differences in the manufacturing of the inoculate result, especially from the routine of centrifugation and whether either bovine thrombin or calcium chloride is used in activation., The used end product may vary by the used volume and the number of injections administered, as well as the color, platelet count, the number or absence of leukocytes, and its protein content. Recently, a number of reports have been published showing promising results for the treatment of AGA. Unfortunately, these studies were generally small, poorly controlled, without outcomes' objective and measured quantification and therefore, they were not included in this meta-analysis. Betsi et al. treated 42 alopecia patients with PRP, five times during over 2 months showing an improvement in hair pulling test and a high overall patient satisfaction. Indeed, they found in 31% of cases some drowsiness and sensible scalp. Schiavone et al. performed the largest study on this topic, including 64 male patients with AGA and they were treated with a regimen of PRP enriched with leukocytes in addition to concentrated plasma proteins. Two sequential injections were performed at initiation of the study and subsequently at three months. The evaluation was performed on the basis of global assessment of before and after photographs by unblinded assessors showing an improvement in appearance for 62 of the 64 patients. Another noncontrolled, nonblinded study of 22 patients found an increase in total hair density from a mean of 143.1 at baseline to a maximum of 170.7 hairs/cm 2 at 3 months follow-up. Another noncontrolled, nonblinded study of 11 patients  detected a significant reduction in hair loss between first and fourth injection. Particularly, hair count increased from an average number of 71 hair follicular units to 93 hair follicular units, with a negative pull test was in 9 patients. Singhal et al. performed a similar study on 10 patients also showing clinical improvement in the hair counts, thickness and root strength. They indeed had three patients complaining a mild headache after the initial procedure. More recently, Navarro et al. reported an overall increase of hair density and an increase of 6.2% anagen hair follicles while a decrease of 5.1% among telogen ones on 100 patients treated with PRP, similarly to Alves and Grimalt  We did not attempt to pool the data existing on hair follicle cycles, as they were not consistent among the included studies. Nonetheless, PRP showed promising results also combined with hair follicular transplant to enhance the postoperative outcomes., Particularly, Uebel studied a short series of patients comparing two areas of hair transplant with or without PRP in the root of the grafts. Two areas (2.5 cm 2) were marked on the scalp and each planted with 20 grafts/cm 2. After 1 year, the area implanted with the PRP-enriched grafts demonstrated a higher follicle units survival rate and density. In a murine model, Miao et al. demonstrated some influence of PRP on hair regrowth when simultaneously injected with transplanted hair follicles, with consistent data, further encouraging clinical applications. Again, the data about PRP and hair growth, together with a surgical hair transplant, are sparse and heterogeneous although promising. Nevertheless, these outcomes can be explained by the physiological role of platelets degranulation during inflammation, which is stimulated by surgical hair transplantation, a traumatic event causing inflammatory response and chemotaxis. For this reason, we believe that surgical transplantation of hair follicles with PRP might be more effective that PRP alone. The results of this meta-analysis should be viewed in light of a number of limitations and potential bias influencing these findings. Only six studies were used for this pooled analysis, only four of them were randomized controlled trial ,,,, and two were observational , with clear heterogeneity in methods and settings [Table 2]. We wanted to include only comparative studies to better assess the efficacy of PRP, missing the outcomes of one-arm studies. The number of patients considered was extremely small and there were differences in patients' age, devices used, centrifugation methods, control, and areas of treatment, which might be a confounding factor for the results. Important statistical heterogeneity (I2 >75%) was found in all analysis [Figure 2], [Figure 3], [Figure 4], [Figure 5], [Figure 6], showing important differences in methods and study settings. However, the exclusion of any study from the analysis did not materially change the summary estimates, but funnel plot for the primary outcomes showed significant asymmetry, which indicates that publication bias might have somehow influenced the results. 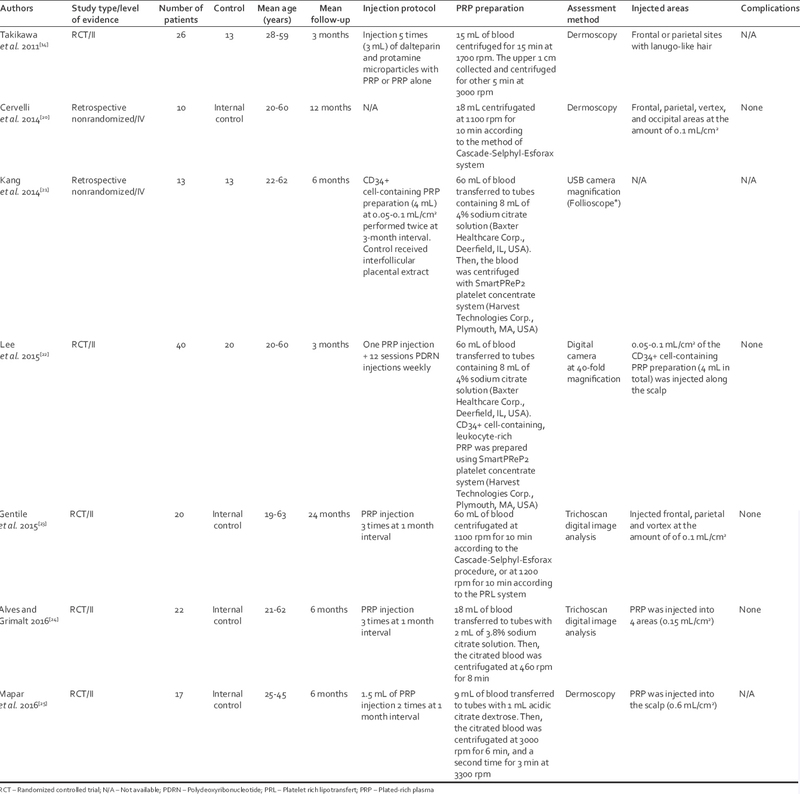 Other major limitations of this pooled analyses include the fact that most of the included studies used internal controls, where the patient's contralateral side or other areas served as its own control, whereas in others, patients were randomized into groups where PRP was either used or not used [Table 2]. There were differences in the treated scalp areas and in some cases, the control group was treated with placental extract  or dalteparin and protamine containing micro particles  with no placebo control. PRP injection for local hair restoration in patients with AGA seems to increase hairs number and thickness with minimal or no collateral effects. However, the current evidence does not support this treatments modality over other treatments due to the lack of clinical evidence, established protocols (i.e., number of sessions, centrifugation, zones to be injected, etc. ), and long-term follow-up outcomes. The results of this meta-analysis should be interpreted with caution because it includes pooling many small studies and larger randomized studies should be performed to verify this perception. The medical literature does not confirm that the treatment is scientifically relevant. The addition of PRP might be useful in improving the outcomes of hair transplantation procedures, but there is no evidence whether PRP is more effective than minoxidil or finasteride treatments. Larger studies with long-term follow-up are warranted to validate this promising treatment modality. Tabolli S, Sampogna F, di Pietro C, Mannooranparampil TJ, Ribuffo M, Abeni D, et al. Health status, coping strategies, and alexithymia in subjects with androgenetic alopecia: A questionnaire study. Am J Clin Dermatol 2013;14:139-45. Eppley BL, Pietrzak WS, Blanton M. Platelet-rich plasma: A review of biology and applications in plastic surgery. Plast Reconstr Surg 2006;118:147e-59e. Mishra A, Pavelko T. Treatment of chronic elbow tendinosis with buffered platelet-rich plasma. Am J Sports Med 2006;34:1774-8. Hammond JW, Hinton RY, Curl LA, Muriel JM, Lovering RM. Use of autologous platelet-rich plasma to treat muscle strain injuries. Am J Sports Med 2009;37:1135-42. Virchenko O, Aspenberg P. How can one platelet injection after tendon injury lead to a stronger tendon after 4 weeks? Interplay between early regeneration and mechanical stimulation. Acta Orthop 2006;77:806-12. Petrungaro PS. Using platelet-rich plasma to accelerate soft tissue maturation in esthetic periodontal surgery. Compend Contin Educ Dent 2001;22:729-32, 734, 736. Schiavone G, Raskovic D, Greco J, Abeni D. Platelet-rich plasma for androgenetic alopecia: A pilot study. Dermatol Surg 2014;40:1010-9. Navarro MR, Asín M, Martínez MA, Martinez AM, Molina C, Moscoso L, et al. Management of androgenetic alopecia: A comparative clinical study between plasma rich in growth factors and topical minoxidil. Eur J Plast Surg 2016;1:1-8. Leo MS, Kumar AS, Kirit R, Konathan R, Sivamani RK. Systematic review of the use of platelet-rich plasma in aesthetic dermatology. J Cosmet Dermatol 2015;14:315-23. Moher D, Liberati A, Tetzlaff J, Altman DG, PRISMA Group. Preferred reporting items for systematic reviews and meta-analyses: The PRISMA statement. Int J Surg 2010;8:336-41. Wells GA, Shea B, O'Connell D, Peterson J, Welch V, Losos M, et al. The Newcastle-Ottawa Scale for Assessing the Quality of Nonrandomised Studies in Meta-Analyses; 2014. Available from: http://www.ohri.ca/programs/clinical_epidemiology/oxford.asp. [Last accessed on 2016 Jun 28]. Takikawa M, Nakamura S, Nakamura S, Ishirara M, Kishimoto S, Sasaki K, et al. Enhanced effect of platelet-rich plasma containing a new carrier on hair growth. Dermatol Surg 2011;37:1721-9. Furukawa TA, Barbui C, Cipriani A, Brambilla P, Watanabe N. Imputing missing standard deviations in meta-analyses can provide accurate results. J Clin Epidemiol 2006;59:7-10. Mantel N, Haenszel W. Statistical aspects of the analysis of data from retrospective studies of disease. J Natl Cancer Inst 1959;22:719-48. Cervelli V, Garcovich S, Bielli A, Cervelli G, Curcio BC, Scioli MG, et al. The effect of autologous activated platelet rich plasma (AA-PRP) injection on pattern hair loss: Clinical and histomorphometric evaluation. Biomed Res Int 2014;2014:760709. Kang JS, Zheng Z, Choi MJ, Lee SH, Kim DY, Cho SB, et al. The effect of CD34+ cell-containing autologous platelet-rich plasma injection on pattern hair loss: A preliminary study. J Eur Acad Dermatol Venereol 2014;28:72-9. Lee SH, Zheng Z, Kang JS, Kim DY, Oh SH, Cho SB, et al. Therapeutic efficacy of autologous platelet-rich plasma and polydeoxyribonucleotide on female pattern hair loss. Wound Repair Regen 2015;23:30-6. Gentile P, Garcovich S, Bielli A, Scioli MG, Orlandi A, Cervelli V, et al. The effect of platelet-rich plasma in hair regrowth: A Randomized placebo-controlled trial. Stem Cells Transl Med 2015;4:1317-23. Alves R, Grimalt R. Randomized placebo-controlled, double-blind, half-head study to assess the efficacy of platelet-rich plasma on the treatment of androgenetic alopecia. Dermatol Surg 2016;42:491-7. Mapar MA, Shahriari S, Haghighizadeh MH. Efficacy of platelet-rich plasma in the treatment of androgenetic (male-patterned) alopecia: A pilot randomized controlled trial. J Cosmet Laser Ther 2016;18:452-5. Foster TE, Puskas BL, Mandelbaum BR, Gerhardt MB, Rodeo SA. Platelet-rich plasma: From basic science to clinical applications. Am J Sports Med 2009;37:2259-72. Wroblewski AP, Melia HJ, Wright VJ. Application of platelet-rich plasma to enhance tissue repair. Oper Tech Orthop 2010;20:98-105. Nguyen RT, Borg-Stein J, McInnis K. Applications of platelet-rich plasma in musculoskeletal and sports medicine: An evidence-based approach. PM R 2011;3:226-50. Marx RE. Platelet-rich plasma: Evidence to support its use. J Oral Maxillofac Surg 2004;62:489-96. Anitua E, Sánchez M, Nurden AT, Nurden P, Orive G, Andía I, et al. New insights into and novel applications for platelet-rich fibrin therapies. Trends Biotechnol 2006;24:227-34.
de Mos M, van der Windt AE, Jahr H, van Schie HT, Weinans H, Verhaar JA, et al. Can platelet-rich plasma enhance tendon repair? A cell culture study. Am J Sports Med 2008;36:1171-8. Lyras DN, Kazakos K, Agrogiannis G, Verettas D, Kokka A, Kiziridis G, et al. Experimental study of tendon healing early phase: Is IGF-1 expression influenced by platelet rich plasma gel? Orthop Traumatol Surg Res 2010;96:381-7. Lee KS, Wilson JJ, Rabago DP, Baer GS, Jacobson JA, Borrero CG, et al. Musculoskeletal applications of platelet-rich plasma: Fad or future? AJR Am J Roentgenol 2011;196:628-36. Singhal P, Agarwal S, Dhot PS, Sayal SK. Efficacy of platelet-rich plasma in treatment of androgenic alopecia. Asian J Transfus Sci 2015;9:159-62. Uebel CO, da Silva JB, Cantarelli D, Martins P. The role of platelet plasma growth factors in male pattern baldness surgery. Plast Reconstr Surg 2006;118:1458-66. Miao Y, Sun YB, Sun XJ, Du BJ, Jiang JD, Hu ZQ, et al. Promotional effect of platelet-rich plasma on hair follicle reconstitution in vivo. Dermatol Surg 2013;39:1868-76.